One of my favorite baby necessities is a muslin swaddling blanket. They are lightweight, oversized, and super soft. I discovered them before I had M2 and I have used them almost exclusively for him. The most well-known muslin swaddling blankets are from aiden + anais , but I found another great company, Bambino Land. Their swaddling blankets are made with organic cotton muslin, are great quality, and get softer with every wash. The swaddling blankets are 47 inches square, the perfect size for easily wrapping your baby up in a good swaddle, unlike the normal receiving blankets that only work for smaller newborns. Of course, some babies sleep better swaddled for the first few months and this blanket is still big enough to do that. And because it is made from lightweight, airy muslin, you don't have to worry about baby overheating. Many parents give up on swaddling baby too quickly because they never really learn a good technique or the traditional receiving blanket just isn't big enough. Of course, muslin blankets are great for swaddling babies, but I have also used them as a breastfeeding cover. When I feel the need to be covered while nursing, it's now my first choice. Regular baby blankets are usually too small or heavy to keep a curious baby under cover. When I tried a nursing cover with a strap, I felt like it drew more attention to what I was doing and was more trouble than it was worth. 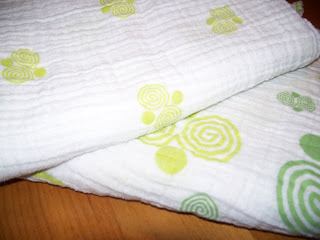 The muslin blanket is thin so baby doesn't get hot and it lets light in and is easy to tuck under baby to keep closed. Of course, the cotton muslin is very absorbent and works great for a burp cloth in a pinch. I love products that serve more than one purpose. Prices for muslin swaddling blankets may seem to be expensive at first because they are typically are sold in sets of 2 or more. But Bambino Land has a selection of "Odds & Ends", single organic muslin blankets for $10. That is a great deal, especially once you get it and find out how much you love them. Hi, I'm passing by and following from blog hop. When you get a chance, please check out my blog and follow me back?